CJE engages relevant industry partners to supplement education opportunities for members and broaden the reach of CJE’s curriculum. Hassle-free and cost-effective, CJE’s Training Center is composed of web-based education partners offering a full array of construction related, business, and JOC specific content. Many of the courses offer Continuing Education certificates. Please note that members receive between 15%-25% discount with our partners. You must log into the LMS to register for Training Events. If you are not a member, we have published public access to portions of the training portal. Just follow the link to get started with JOC training. Registration for the next in-person class will begin soon but the online program can be accessed via our Learning Management System (LMS). Our CJE members receive an additional discounts so contact us to make sure you receive the correct registration code at education@jocexcellence.org. 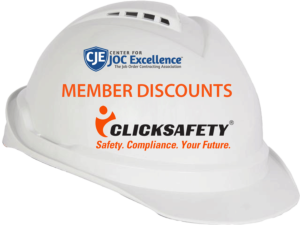 Any of CJE’s members, staff, and associates can access our discount with the premiere ClickSafety online program. Safety comes first so we offer this resource to help our members save money and obtain excellent and flexible safety training. Just follow the link to get started and use our discount code. The discount code is CFJOCE. Think safe and be safe! Please use the CJE members discount code to save money on ClickSafety training. The code is CFJOCE Questions? contact us info@jocexcellence.org. Anyone can access CJE’s Lorman education center and take classes. Just follow the link to get started. Our CJE members receive an additional 15% discount on Lorman products so log into the members only site to obtain the discount. Perks and lifestyle benefits come with your CJE membership. No more worries about managing discounts at your office. All members and employees can take advantage of the association discounts through our Partner discount programs. This is a free membership benefit to help lower your travel expenses, purchase tickets, and buy those last minute gifts – all at your fingertips. CJE is here to help make life a little easier for our members!